Ever imagined what a new aged PC would like? Gone are those days of bulky desktops and laptops. The all new iPad 9.7 inch is finally here and has the power to do almost anything. And it is so intuitive you could use it any way you want — with touch, a keyboard or even a pencil. Yes, that’s right! 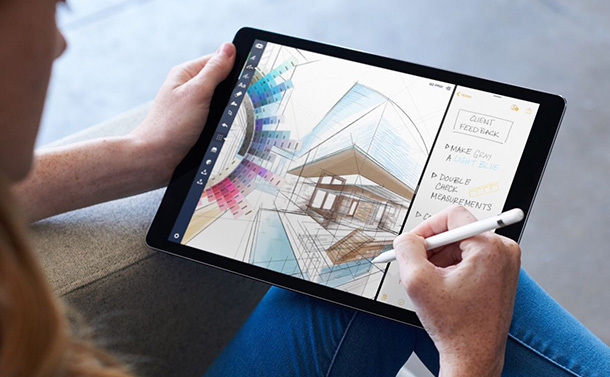 Apple’s latest iPad model supports Apple Pencil too, offering you an amazing pixel perfect precision and responsive experience. And you know what’s the best part? This latest iPad model won’t cost you a fortune. It is available at a super affordable price starting from just 329.99$. This is surely one must buy gadget of the season, right? We’re sure you must’ve decided to head to the Apple Store right now! But before you do that here are a few things to learn about your new tablet. Apple pencil support is one of the most unique feature which distinguishes this iPad with its previous model versions. Apple Pencil makes it a lot easier to jot down anything you want, draw stuff, sign a lease or do anything which you naturally do with a regular pencil. So, to begin using Apple Pencil on your new iPad first remove its top and plug it to your iPad’s lightning port to charge it. In just a few seconds you will receive a pairing request on the screen. Tap on “Pair” to proceed and then you can start your creative session on iPad. As soon as your Apple Pencil runs out of battery, simply plug it back on your iPad’s lightning port again to charge it. If you’re planning to use Apple Pencil quite frequently then it’ll be useful if you set up a battery widget on home screen. If battery widget isn’t already enabled on your iPad head on to the leftmost page of home screen which includes “Today’s view”, scroll down to the bottom of page and tap on “Edit”. In the list of available widgets, look for Batteries and tap on the tiny plus icon right next to it. Once you’ve successfully added the widget on your home screen, checking the battery percentage of Apple Pencil will be super convenient. All you have to do is simply swipe down on the home screen, head on to “Today’s view” and there you can find the Apple Pencil’s current battery status. Creating a new note on new iPad just got a lot easier! Head on to Settings > Notes > Access Notes from Lock Screen. Once you enable this feature you’ll be able to create notes without unlocking your iPad as well. With an advanced A10 fusion chip this new iPad makes multitasking experience way smoother. The split screen mode allows you to open two tabs simultaneously for faster access. So, now if your friend texts you while you’re busy making your business plan, don’t keep them waiting. This is one reason why we love our iPad more than iPhone. Yes, forget copy and paste! Moving images and files was never this easy. Simply long press on any image or file and hover it over a certain app to copy it there. While you’re working in split screen mode, drag and drop functionality is one convenient way to transfer files from one folder to another. So fellas, here were a few things to keep in mind before buying the new iPad. Tons of useful features power packed in one slender gadget, isn’t it great? So, when are you getting your new iPad?